When a desperate Duchess of York asks for his help, Beau Brummell wouldn't think of refusing. The cantankerous Countess of Wrayburn has been fatally poisoned, and her paid companion is the prime suspect. Unfortunately, the Duchess is the one who arranged the young woman's employment with the late Countess. If the accusations prove true, the scandal would ruin the Duchess's good name. Ever the gentleman, Brummell hastens to the Wrayburn house to do some inquiring of his own. It doesn't take long to realize that more than one person had motive to poison Lady Wrayburn. And Beau Brummell is going to find out who they are. Because if there's one thing that's never in style, it's murder. "George Bryan "Beau" Brummell, the arbiter of fashion in Regency England, may seem an unlikely protagonist for a crime novel, but Stevens . . . brings off this debut mystery with great èlan. Readers of both historical mysteries and Regency romances will eagerly await sequels." 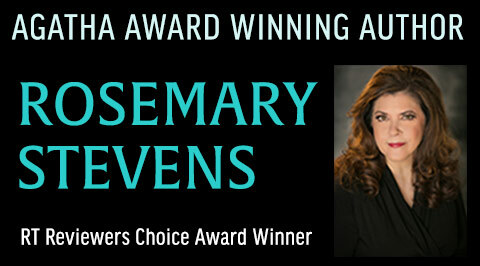 "With DEATH ON A SILVER TRAY, Ms. Stevens has pulled a hat trick: The novel likely will appeal equally to fans of romances, mysteries, and historical fiction. For that matter, it will appeal to anyone who enjoys a well told tale." "If P.G. Wodehouse had decided to write mysteries set in the Regency period with a sleuth who’s a combination of both Jeeves and Bertie, he might have come up with a character much like Rosemary Stevens’ Beau Brummell." "A light, exciting 1805 England is re-created with expertise, stylish prose, and dry humor." "Beau Brummell, the legendary aesthete and Savile Row patron saint, is brought to life in the role of a fashionable society sleuth in an historical fiction novel. A light, fast, witty, and clever read. Expect a pleasant surprise from this unlikely exposition in Style." 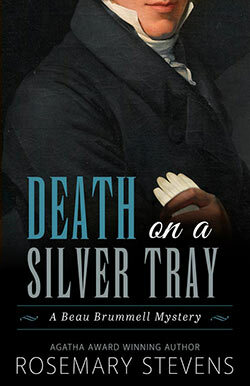 "DEATH ON A SILVER TRAY is a delightful book that will thrill mystery lovers and regency fans equally. The mystery is a solid, classic tale, well clued and guaranteed to keep the reader guessing. Stevens does very well with her regency setting, capturing the essence of Brummell and the spirit of the times. Numerous historical figures add to the reader’s enjoyment. As a bonus, there is a delightfully fastidious Siamese called Chakkri. Sit back, relax, and enjoy one of the most entertaining reads." "Beau Brummell makes a dandy sleuth. Rosemary Stevens’ dashing detective romps through Regency England exposing the wickedness beneath the wit, wealth, and often heartless snobbery of an elegant era." "Beau Brummell proves as adept at sniffing out a murderer as he is at squashing the socially pretentious in Rosemary Stevens's delightful debut mystery. A charmer from first page to last." I heard the knocker sound downstairs and decided that whoever it was would have to be told I was not at home. I must be on my way to Sidwell's if I wished to return to London by the time of the auction. Satisfied with my Venice-blue coat, buckskin breeches, and gleaming Hessian boots, I picked up my hat, selected a carved ebony cane from my collection, and closed the door to my bedchamber behind me. I had almost reached the stairs when Robinson stopped me. I held up a restraining hand. "I am not at home to anyone who has had the misfortune to call." I put my foot on the first step. "What is it?" I demanded impatiently, swinging around to face him. "The hired coach is waiting out front." Robinson assumed an injured air. "I am sorry to delay you, but thought you might wish to know that Her Royal Highness, the Duchess of York is in the drawing room." I stood thunderstruck. "Good God, man, what is she doing in Town? She rarely leaves Oatlands." I felt my chest tighten in alarm. I gave Robinson no chance to reply. I hastened past him and threw open the double doors to the drawing room. There was Frederica, the Royal Duchess herself, seated in a chair. My heart raced. "Freddie! What in heaven's name are you doing here? Not that I am anything less than delighted to see you." I paused only long enough to deposit my hat and stick on a nearby table, then rapidly crossed to her side and bowed. She rose to clasp both of my outstretched hands. We stood like that for a moment looking at one another. She is a small, dignified lady of some thirty years. Her brown curly hair was held back from her face with a pale green silk bandeau which matched her gown. A few tendrils of hair framed her face, the rest fell to her shoulders. Her normally serene countenance was marred by worry. "Oh, George," she said in her sweet, light voice. "I am much distressed." "Please sit down," I said, indicating a chintz-covered sofa. I took the place next to her, apprehension filling me at this unprecedented visit. I often spend weekends at Freddie's country estate, Oatlands, but she has never come to my rooms. This is, after all, a bachelor's residence. And I had just had her letter telling me of the new puppies and her prediction that she would be a busy lady this week. "Tell me what is wrong, Freddie." "Forgive my manners, George. I know I should be complimenting you on this enchanting room--"
"Never mind that now!" I blurted. "Are you ill? No, I can see you are the picture of beauty and health." That brought a tremulous smile. "You are always the perfect gentleman." "Do you need tea? A glass of sherry, perhaps?" "No, thank you, dear. I shall tell you the news straightaway. Lady Wrayburn is dead!" I am uncertain what I had expected, but it was not this. Confusion was my first emotion. "I am afraid I do not understand, Freddie. I saw the lady yesterday, and she had plenty of life in her, let me tell you. Was it her heart?" Before the Royal Duchess could reply, I muttered, "Forget that. The woman had no heart. Recollect the time you rescued that old hound she ordered shot because his bad hip made him limp?" "I remember it well, but listen to me, George. The countess was murdered!" My eyebrows rose incredulously. "Murdered? By whom?" "That is the problem. The police office at Bow Street thinks Miss Ashton, her companion, poisoned her. But I know, George, I simply know that cannot be true. You see," she ended on a soft wail, "I recommended Miss Ashton for her position with the countess, because I knew her father." "Good God, Freddie," I managed to utter. "People will talk about how I gave my approval to her character, and there could be a scandal. But more importantly, what will happen to Miss Ashton? I cannot stand by and do nothing. That is why you must help me . . . and Miss Ashton." "Freddie, I am Beau Brummell, not Bow Street. What can I do?" "There is only one thing to be done, George. Find out who really killed Lady Wrayburn." The Royal Duchess turned the full force of her compelling blue eyes on me. Alas, I never have been able to deny her anything.